Where do I use my Ancestry voucher code? Created in 2002, Ancestry has allowed people everywhere to delve into their family history with just a few clicks. Getting started couldn’t be easier, with plenty of ways to search records dating back 100s of years. Simply enter already known family history, and let Ancestry find different hints and insight into your family story so you can discover even more relatives and where and how you’re family began. With censuses from as far back as 1841, you can see what occupation a great ancestor had in addition to bounds more information including births, deaths and marriages in the family. You could even explore the card catalogue for military records and school directories, with plenty of information about WW1 and the men and women who served in it. Ancestry has the world’s biggest collection of family trees, and by becoming a member, you will join millions of profiles in the quest to know a little bit more about where their family roots lie, you can even search through public family trees to find more about the people around you. Always advancing in ways to make the discovery process more accurate, you can even get your DNA samples tested to help uncover distant relatives and more unique details about your family and your ethnicity. Uncover your genealogy, family history and even what your surname means with the surname meaning tool. Begin your free trial today and start bringing your own story to life, you can even check out the Ancestry blog for more inspiration, information and historical insight. With the Ancestry family tree tool, you can build a truly visual hub of information about you and your family. Start from scratch, by entering information about your current family and past ancestors that you’ve known about. In time Ancestry.co.uk will search its records and historical knowledge to find hints about new unknown relatives and intriguing details that you can then add to your tree. These hints will come in the form of leaves. The more and more leaves you get the more your story will become clear, allowing you to open your eyes to a whole new world of exciting family information. Innovative in the field of family and historical records, as well as extremely revealing, the DNA tool helps you uncover where you’ve descended from and what places your genetic makeup includes. Ancestry aims to rekindle your relationships with those in your gene pool through the use of DNA testing. With easy sampling, Ancestry could help bring you closer to people that you never thought you had. Brimming with data from more than 3 million others like you, this is a truly unique opportunity to help delve into your richer family history. Simply order your complete kit with easy-to-follow instructions, return a small saliva sample in the prepaid envelope, wait for your DNA to be analysed at more than genetic markers and within 6-8 weeks, you’ll receive an email with a link to your online results. The World War I records at Ancestry tell you what your relatives looked like, where they came from, the places they fought and the medals they earned. Simply enter their names, date of birth, birthplace and death year into the search bar provided and find all the information available on your past relatives and their involvement in WW1. With millions of records for you to access you’re bound to find some information about your ancestors if it’s out there. Discover British army records, pension records, WW1 medal roll index cards and silver war badge records, all with your free trial at Ancestry. Will my family tree be kept private? Members can choose to keep their family tree profiles visible to the public, private and searchable or private and non-searchable where your tree will only be visible to you and others you have invited to view it. If you are having difficulty using your membership or have a question regarding researching a collection please email. Alternatively, you can call for free on 0800 404 9723. If your family history is something of a mystery or you want more information about your ancestors, ethnicity and where you’re family name came from join Ancestry.co.uk. Start your free trial today and browse through hundreds of censuses, military and war records, school directories and birth, death and marriage certificates to discover more about your family’s story. 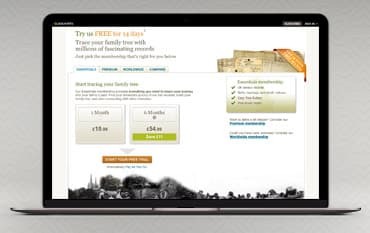 Once your free trial has ended begin an account with one of our Ancestry voucher codes and save money on discovering everything from passenger lists to family trees. Connect with others through your own photographs, records and much more, gain a better understanding of your beautiful family journey and even test your DNA with Ancestry.co.uk.